property, which adds images and color to the background of any element on a Web page. It opens up a creative toolbox for styling links, bulleted lists, and more. Unlike HTML, which automatically tiles background images horizontally and vertically—sometimes resulting in a frightening pattern—CSS gives designers precise control over the placement and tiling of background images. For example, you can choose to have a graphic appear only once, tile vertically, or stay put on screen even when the viewer scrolls through the page.
) to that graphic. This is the only property required in order to place an image in the background. Note that, unlike HTML, the CSS code doesn’t use quotation marks in its path to the image. Although they’re permissible, Internet Explorer 5 on the Mac can’t find the image if it’s enclosed within quotation marks.
. If you exclude this property, the image will tile vertically and horizontally. 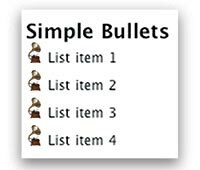 A Bullet to Call Your Own With CSS, you can use images as custom bullets. property lets you add a color to your page or to another page element such as a paragraph, a sidebar, or a banner. When you use this shortcut, the order of the properties is important. They should always be listed in this order: color, path to graphic, horizontal placement, vertical placement, and tiling options. property is to alter the appearance of traditional HTML. Tired of the black circles and squares that set off lists on your Web pages? Why not remove those boring bullets and provide your own graphics (see “A Bullet to Call Your Own”)? Been There Show your readers where they’ve been by marking visited links with a check mark. This gives you a clean slate and eliminates any indentations a browser might apply to the list. Now you’re ready to add your bullets. (If you don’t have any handy, click here for free bullet images.) For this example, I’ll assume that I have an image called mybullet.gif in the same directory as the CSS file. property, you can (see “Been There”). This optional step removes the underline from each link (those underlines can clutter a design). defines the color of links, and adds a little padding on the right edge of the link (to accommodate the check-mark graphic). tag—it’s easy to create complex pages that have multiple images placed throughout them.